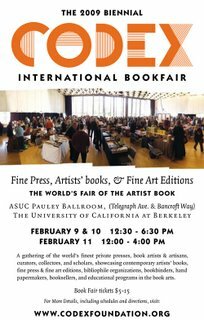 Magnolia Editions has a booth at the Biennial Codex International Book Fair on February 9, 10, and 11, 2009! Billed as "The World's Fair of the Artist Book," this fair comes around only once every two years; this is the second Codex. With booths from all over the world, each more amazing and creative than the next, it is impossible to see everything in one day. Many attendees and participants have been heard to say that there is nothing like it in the world. We will have samples on hand to demonstrate the possibilities of our state-of-the-art automated cutter and flatbed UV inkjet printer for precision-cut and printed book projects.